For those who like a good drink—be it straight spirit, cocktail or wine—getting to craft what’s inside the bottle takes the sipping experience to the next level. At one time, this sort of experience was reserved for wineries, but Pioneer Square’s Copperworks Distilling (1250 Alaskan Way; 206.504.7604) joined the movement in 2017 with its quarterly whiskey-blending workshops ($175 per person; next workshop is February 17). And those events are taking off in popularity with lovers of whiskey and other spirits. 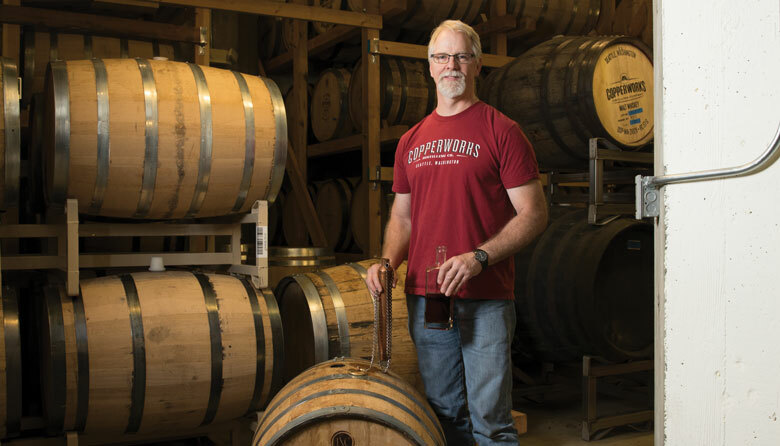 Copperworks was opened in 2013 by two brewers, Jason Parker and Micah Nutt, who are old friends. Parker was the original brewer at Pike Place Brewing Company in 1989 and then moved on to stints at Fish Brewing Company, Redhook and Pyramid. Nutt was an accomplished home brewer. When Washington legislation made craft distilleries possible in 2008, the two decided to channel their brewing experience into distilling. The workshop, which accommodates 20 people, begins with the same process undertaken at the distillery’s staff tasting panels every Wednesday: tasting various whiskeys and comparing notes. In front of each person sits a pretty little antique-looking tray holding four short, curvy glasses, each containing a large sample of a different Copperworks whiskey. Each is made with one of Copperworks’ two single malt whiskey recipes, but aged in different cask types, for different lengths of time and at different proofs. Under each glass is a number that corresponds to a note-taking sheet. Smelling and sipping through the four, participants consider each whiskey’s nose (or scent), taste and finish (that lingering flavor in your mouth), and compare impressions with neighbors, and with Parker. The real artistry comes next, when participants start blending those four whiskies, attempting to find a combination that fits their taste, a mix that is more than the sum of its parts when you sip it. Once students have settled on their mix, they head to the casks. Using a a “dipping dog” tool, each person extracts the whiskey from different casks and fills a bottle. Add a label, seal it, and you’ve got your very own whiskey to take home. While there is a necessary and essential element of education involved, there’s plenty of fun: snacks, jokes and new whiskey-loving friends (bonding over attempts to distinguish the smell of caramel apples from green caramel apples, for example). These sort of blending workshops are ideal for groups of friends, lovers of well-crafted beverages and anyone who dreams of bottling spirits or wine. Why take a whiskey-blending class instead of just buying a bottle of it? It’s the same as wanting to make your own perfect meal if you really love food, or wanting to write if you really love books, or wanting to sing if you really love music. And at Copperworks, it’s a chance to get a hands-on demonstration of, as Parker explains, “one of the most important aspects of whiskey manufacturing, which insiders call nosing and blending. That is, blending the correct barrels together to achieve the desired flavor. Almost no one talks about this aspect of whiskey production, even though it is the single most important job at the distillery with regards to producing desired whiskey flavors.” For whiskey enthusiasts, developing a nose for this process is an amazing experience. Each year, this SoDo winery hosts its Cantilever Blending Party for wine club members (wine club membership is free with purchase of a case of wine per year, and has other benefits as well), who test wine blends using four varietals. One preferred blend is chosen by the party, aged for six months, and then club members take a bottle home. Winemaker for a Day class ($125 per person) at this longtime institution includes tasting varietals under expert tutelage, followed by blending and bottling a personalized bottle of wine. Though you’ll first have to get yourself to Walla Walla, the Blending Experience ($85 per person) here includes a lesson in Washington wines, tasting and the chance to craft a singular Northstar wine blend using its wines—and getting a bottle of that blend to take home.